Fresh ‘n feisty from triumphantly advancing their contagious and quirky Americana from Glasgow to Penzance in ye olde UK, alt-roots DIY’ers Gandalf Murphy & The Slambovian Circus of Dreams bring their haunting signature songs and sincerity back to the Hudson Highlands from whence it originated. 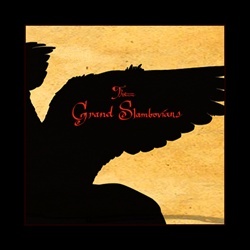 But myth is a must in the mind-space of Slambovia, and Woodstock’s Bearsville Theater is pleased to loudly premiere the advent of “The Grand Slambovians” which is both the band’s latest reincarnation and the title of their new soul stirring CD. Manically melodic, the bold new songs stitch to the band’s classics like an old paisley patchwork quilt wrapped around a very large family. Thus a Thanksgiving weekend performance promising that ‘Grand’ family of friends and fans a ‘Slambovian’ feast like never before! Be the first to comment on "The Grand Slambovians @ Bearsville Theater, Saturday, Nov 27 9pm"